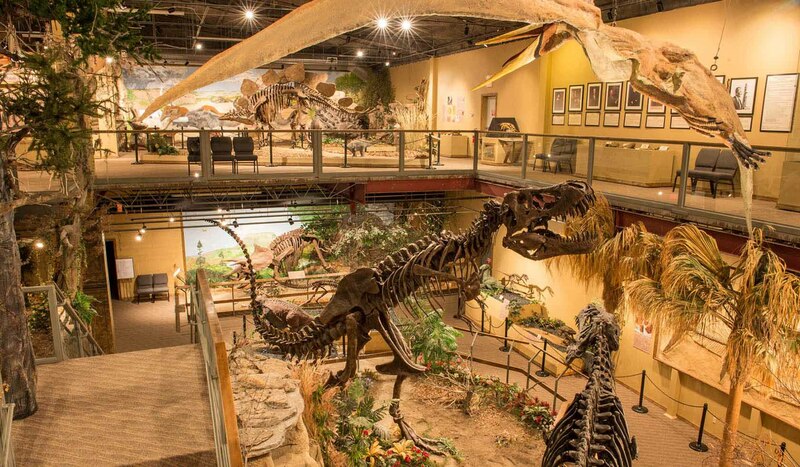 The Glendive Dinosaur and Fossil Museum is a 20,000 square foot facility featuring more than 23 full-sized dinosaur and fossil exhibits plus a myriad of singular fossils. This museum is the largest dinosaur and fossil museum in the United States to present its fossils in the context of biblical history. Exhibits are being added regularly so stop back and see what has changed since your last visit. The main exhibit of the museum is composed of an 18-foot tall , 40-foot long Tyrannosaurus rex and a 39-foot long Acrocanthosaurus. Other exhibits include the 40-foot long Tylosaur, a giant sea turtle and a Plesiosaur in the Marine Room; a Mastodon, Sabre-tooth cat and a dire wolf in the mammals from the ice age exhibit; a Triceratops exhibit; an age of the earth exhibit; an icons of evolution exhibit; and a new display that explains the formation of the geologic column. All artwork, models, and environments were created by Billings artist Melanie Richard. Along with the exhibits, the museum features a special Biblical history exhibit, a theater, and a resource center and gift shop. The gift shop specializes in dinosaur merchandise and offers one-of-a-kind jewelry featuring original dinosaur bone material. The resource center offers both books and videos selected to answer many of the challenging questions raised by the fossil record. The museum also sponsors fossil digs in the badlands close to Glendive, giving participants an opportunity to experience paleontology first hand as they learn how to identify, collect and interpret fossils from a Biblical creationist's perspective. Dig-for-a-day or half-day is available for individuals, families, or small groups. Reservations are required and liability waivers are necessary for each digger. Museum hours are seasonal. In the spring and fall the museum is open on Fridays and Saturdays. In the summer the museum is open Tuesday through Saturday. The hours of operations are always from 10:00am to 5:00pm. Check out the museum website or call ahead to confirm. Glendive Dinosaur and Fossil Museum is located at the northeast corner of the I-94 exit 215 interchange in Glendive, Montana next to Runnings. A T-rex bust mounted on the front of the building can be seen from the interstate. Large letters at the end of the building read "Dinosaur Museum. "Glendive Dinosaur and Fossil Museum is located at the northeast corner of the I-94 exit 215 interchange in Glendive, Montana next to Runnings. A T-rex bust mounted on the front of the building can be seen from the interstate. Large letters at the end of the building read "Dinosaur Museum."